Annora Brown created this image of a bucking bronc for a Macleod Stampede poster. Image courtesy the Glenbow Museum. The cost of admission to the grounds was adults, 75 cents, children, 25 cents, with special prices for Indians. 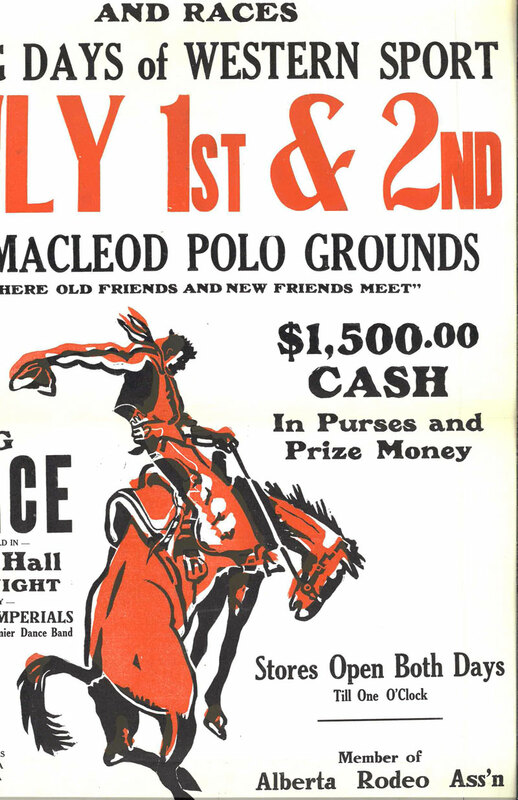 Not only were these posters printed by The Macleod Gazette, but the Gazette itself is proud to have its current masthead designed by Ms. Brown in 1949. Our hope is that as we fan the embers of the life and work of Annora Brown to full flame, both younger people and newcomers will realize what a great contribution this woman has made as a cornerstone of the community. Two hundred and 60 of her paintings in storage at the Glenbow Museum are currently being photographed and digitized. By mid-September they will be available for viewing on the Glenbow Web site. Prints can then be purchased from the museum.